You cannot view this unit as you're not logged in yet. Please return to the course home page and login or register to continue. Unit 2 Why is Advocacy Important? Unit 5 What Makes a Successful Advocate? Unit 6 Exercise: Do I Have What It Takes To Be A Good Advocate? Unit 8 What is Public Policy? Unit 18 Who Makes Public Policy? Unit 19 Assignment: Who Can Help? Unit 3 What's Your Issue? Unit 5 What's Your Story? Unit 6 Exercise: What Makes This Story Effective? Unit 8 What Makes a Good Story? Unit 9 What's Your Request for Action? Unit 10 Exercise: What's in a Good Story and Request? Unit 15 Who Can Help Make It Happen? Unit 2 Why Communicate with Policymakers? Unit 6 Why Put It In Writing? Unit 12 Letter? E-Mail? Fax? You Choose! Unit 16 What is Social Media? Unit 5 Exercise: What Did Heather Do Right? Unit 8 Step 3: Practice, Practice! Unit 13 What Makes Testimony Effective? Unit 19 Assignment: How Will I Communicate In Person? Unit 19 Get Out and Vote! Unit 20 Assignment: Are You Ready to Organize? 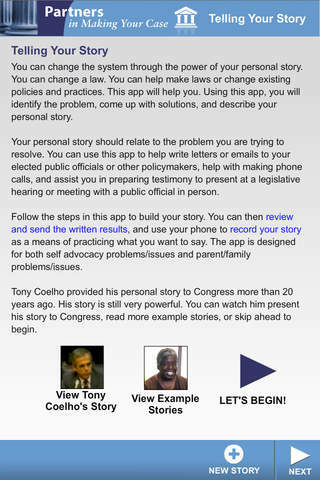 The app, "Telling Your Story," helps you create and practice your personal story with tips on how to best present yourself, to help inform and educate your elected public officials about issues that are important to you. Copyright © 2019. The Minnesota Governor's Council on Developmental Disabilities. All rights reserved. Updated January 2014, November 2017, October 2018.